For our last breakfast in Nashville B and I headed to Más Tacos and we were not disappointed. It is not a fancy place, but to me that is a sign for some good Mexican food. I'm not gonna lie, Nashville is definitely a foodie's delight but truly authentic or delicious Mexican food here has been hard to find. Of course, I am a brat in saying this because I grew up in California and lived by the Mexican border for a while oh and did I mention I am a Spanish language teacher? Although, I am from El Salvador I do know my Mexican food. So buckle up and let me show you what we got. I started out with a Piña and Cilantro Agua Fresca which was super delish and refreshing. A delicious breakfast taco with avocado and crema fresca. 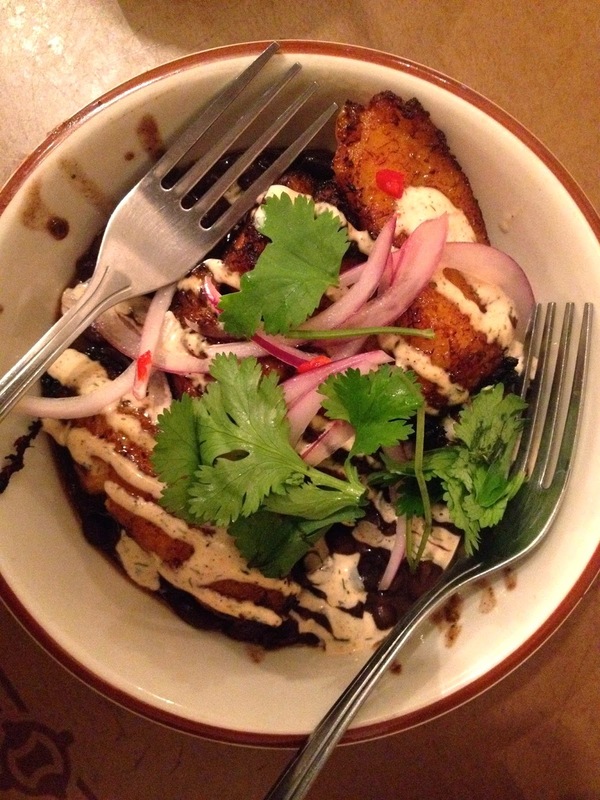 And we split this bowl of Cuban beans with plantains. This was probably my favorite. It reminded me of my youth when I used to have this dish with my family. Even though it's called Cuban beans with plantains this is a common dish in Central America as well. At Más Tacos, there was no abuelita in the back making this food (at least not that I saw) but the young group of cooks do know how to mix some good Mexican flavors together and it was delicious. They also had some awesome spicy salsa verde which I had not been able to find since living in the Rio Grande Valley. I never was able to find huevos rancheros as good as Taco Palenque in the the RGV but breakfast as Más Tacos was a wonderful way to end out foodie adventures in Nashville. And YES, you did read correctly, B, the canine travel team and I are hitting the road TODAY and heading to a new adventure in our covered wagon. You can follow our adventures on Instagram, Facebook, Twitter and of course here on the blog. Looks delish! I agree, finding good Mexican food in the south is harder than you would think, I like going in to the little taqueria's and finding a gem... the chain restaurants are pretty blah. Glad you found a good one! I am dying to know where you are going!!!!! I can tell that is some good Tex Mex! Not to mention a little Cuban surprise of black beans and plantains.. I miss going to Miami and eating Cuban food. Not that I'm complaining, as Austin is covered up with delicious Tex Mex. I haven't thought to look for Cuban cuisine here...must do that soon.